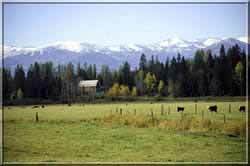 Located on 960 acres of summer pastures with tall pines and breathtaking views of the Selkirk and Cabinet mountain ranges is the Western Pleasure Guest Ranch near Sandpoint, Idaho. A third generation cattle ranch that has been operating on the same land since 1940. 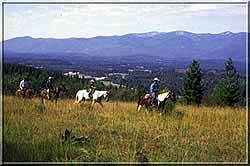 The ranch is located in Idaho's scenic Panhandle region, about 16 miles northeast of Sandpoint, Idaho. Roley and Janice Schoonover, and her parents, ranchers Jim and Virginia Wood, have transformed this historic ranch into one of Idaho's quality guest ranches. Hosts Roley and Janice share their love for their family ranch along with the rich history, beauty and traditions of the area. The ranch offers delightful sleigh rides for groups or couples during the winter and trail rides for all, during the summer. Some activities require that you be a guest at the ranch to participate. Western Pleasure is for folks who appreciate sincere, real country hospitality, while enjoying beautiful handcrafted log accommodations. You will find the lodge atmosphere just right for quiet reflection in the cozy, natural-light loft while the children enjoy the rec-room below, featuring a pool table, TV, and a relaxing outdoor hot tub. The river-rock fireplace in the great room is another favorite with the "guest" families. 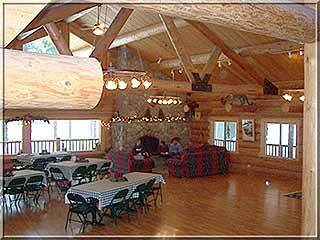 While staying at the Western Pleasure Ranch you are sure to enjoy the hearty ranch style food. The meals are prepared using only the finest ingredients to satisfy your entire family. The delicious beef you will be eating is raised naturally on grain and grass right on the ranch. No steroids are used and the cattle are processed through the family's own federally inspected plant. 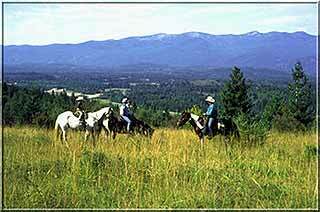 *The beauty and seclusion of beautiful North Idaho are at your fingertips at the Western Pleasure Guest Ranch, located in Sandpoint, Idaho. But that doesn't mean that we don't have all the comforts of home, too! Amenities in the main building include a recreation room featuring a pool table for a friendly game of billiards plus an outdoor hot tub. Accommodations are offered in the 10,000 square foot main lodge, hewn from local timber and offering six spacious guest rooms, each with private bath. Upstairs rooms are themed and have names like Miss Belle, Siesta, Nez Pierce and Duke's. Downstairs accommodations include the Grandma/Grandpa room. Our luxury cabins include wood stoves for warmth on cool evenings. Imagine sitting around the crackling fire after a day of cross-country skiing, sipping hot chocolate with your loved one or family! The Grand Lodge offers cozy common areas. A guest favorite is the great room where guests enjoy the expansive river rock fireplace and comfortable leather seating, The great room is tastefully decorated with a combination of mounted wildlife, including cougar, elk, bear, buffalo and a white moose (from Alaska) and art featuring local artists as well as well known artist Bev Doolittle. The downstairs recreation room provides a television for watching your favorite, classic John Wayne movie. Just off the wrap-around deck, you can submerge in the soothing water of the hot tub, or simply relax in one of the Adirondack chairs and soak up the fresh air and the gorgeous mountain scenery. The loft area offers the perfect reading or napping area, with lots of quiet and showers of natural light. Wireless internet is avialable in the lodge. All of our accommodations have access to laundry facilities. InIdaho has been partnered with Sandpoint hotels and motels for about 21 years. 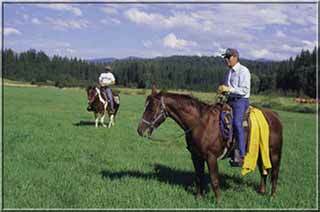 We guarantee the lowest prices for Western Pleasure Guest Ranch reservations. Our local idaho business is staffed by friendly and efficient employees who appreciate that you choose to make your reservations for Western Pleasure Guest Ranch with us. 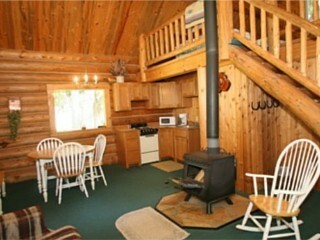 Our rates are always the same or lower as calling the Western Pleasure Guest Ranch direct. 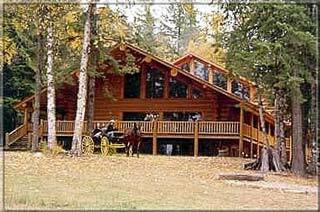 We also offer group rates for Western Pleasure Guest Ranch - just contact us! Directions: About 16 miles northeast of Sandpoint, Idaho. We do not have any current pre-built packages for Western Pleasure Guest Ranch . The Nez Perce room is named after the tribe credited with developing Janice's favorite horse, the Appaloosa. The centerpiece of this room is a comfy queen-size bed wrapped with a colorful handmade quilt. 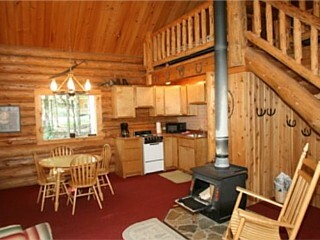 You'll enjoy the large windows with wooded views, private bath and hide-a-way loft with twin bed. This room is located on the upper level in the Grand Lodge. Grandma's room right next door to Grandpa's features a queen bed with Grandma's favorite quilt and a private bath. Welcome the morning sun after a great night's sleep. This room is located on the lower level in the main house. Right across from Grandma's room, naturally, Grandpa's room has a private bath, queen size bed plus a full size bed for extra company. 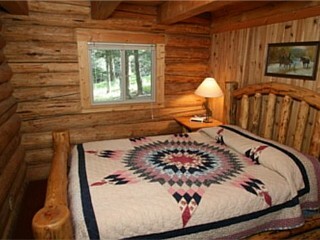 Of course, both beds are adorned with quilts made by Grandma herself (Janice's Mom). 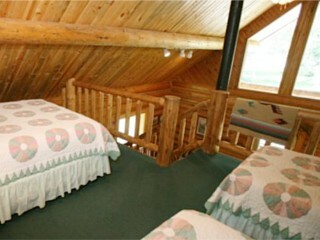 Grandpa's room is located on the lower level of the lodge. 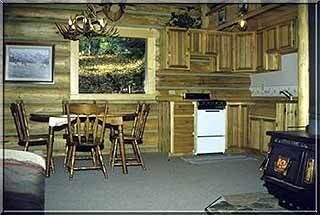 The Hunter cabin offers the most seclusion of the three cabins with its end of the road setting. It is not unusual to watch a doe and fawn grazing outside of this cozy cabin. As the name of this cabin hints, you will experience a sportsman feeling when you enter the cabin. A deerhorn chandelier and various animal mounts make this cabin a genuine North Idaho destination. 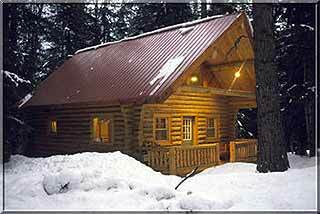 This cabins can accommodate up to six, yet is cozy enough for two, with one bedroom, a loft, furnished kitchen, and classic wood stove heat. Picture the romance of coming back to a fire-warmed cabin after a relaxing day of cross-country skiing, snowshoeing, or sleigh riding. Envision the quiet solitude of a rustic cabin to relax in after a day spent riding, playing horseshoes,or just enjoying the stunning scenery of North Idaho! Approximately 26x22 feet. If you are looking for privacy, but also the convenience of being closest to the lodge you may consider the Settler cabin. 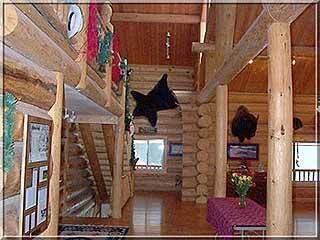 This cozy log cabin has a friendly country décor. This cabins can accommodate up to six, yet is cozy enough for two, with one bedroom, a loft, furnished kitchen, and classic wood stove heat. Picture the romance of coming back to a fire-warmed cabin after a relaxing day of cross-country skiing, snowshoeing, or sleigh riding. Envision the quiet solitude of a rustic cabin to relax in after a day spent riding, playing horseshoes,or just enjoying the stunning scenery of North Idaho! Approximately 26x22 feet. Named in honor of the man who helped shape the image of the west, John Wayne. 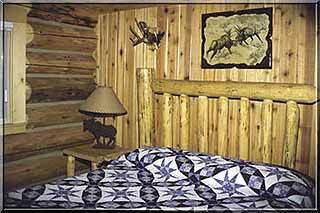 Adorned with western artifacts and images of "the Duke" himself, restful slumber will soon overtake you while nestled in the queen size log bed, and, of course, for your convenience, a private bath. The Duke room is located on the upper level in the Grand Lodge. Scarlett O'Hara would be right at home in this room decorated with the woman's touch. You'll find yourself surrounded in comfort with a queen brass bed, private bath, Victorian rocker and an antique armoire. The Miss Belle room is located on the upper level in the Grand Lodge. Greet the morning sun in the comfort of the southwest. Queen size bed, private bath and cozy loft with single bed make this room warm and inviting. The Siesta room is located on the upper level in the Grand Lodge. Step back into the days of the ol west when you enter the Wrangler Cabin. This spacious, yet cozy cabin is nestled in the trees for extra privacy. This cabins can accommodate up to six, yet is cozy enough for two, with one bedroom, a loft, furnished kitchen, and classic wood stove heat. Picture the romance of coming back to a fire-warmed cabin after a relaxing day of cross-country skiing, snowshoeing, or sleigh riding. 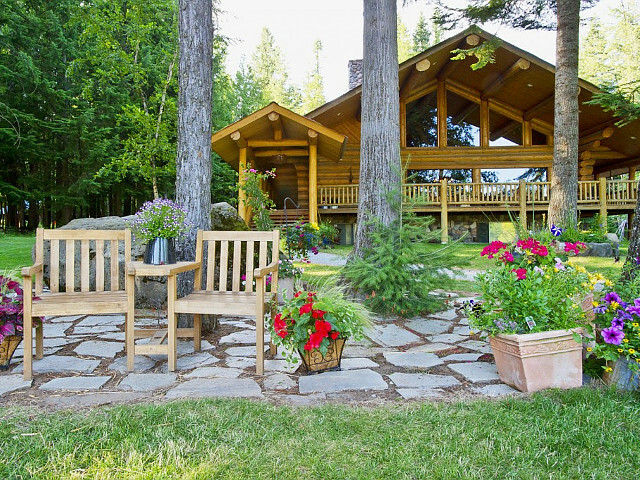 Envision the quiet solitude of a rustic cabin to relax in after a day spent riding, playing horseshoes,or just enjoying the stunning scenery of North Idaho! Approximately 26x22 feet. Outdoor Activites: hiking, horseback riding, sleigh rides and guided fishing. Cabins: decks, kitchenettes, wood stoves and private baths. Please note: Guest reviews may mention certain amenities that may no longer be offered with Western Pleasure Guest Ranch. Please check the amenities prior to booking to confirm. "Excellent experience. Our whole family loved it. We were all ready to move in! However, I still need my car keys back that I left there. Thank you very much for the memory of a very special stay!" Cancellation Policy**:(May vary with special rates, packages & online bookings) A 25% deposit will be taken at time of booking. 100% refund if cancelled 30 days in advance. 50% refund if cancelled 7 days prior to reservation. If cancelled less than 7 days prior to reservation and we are unable to re-book your reservation, full amount for lodging will be charged.